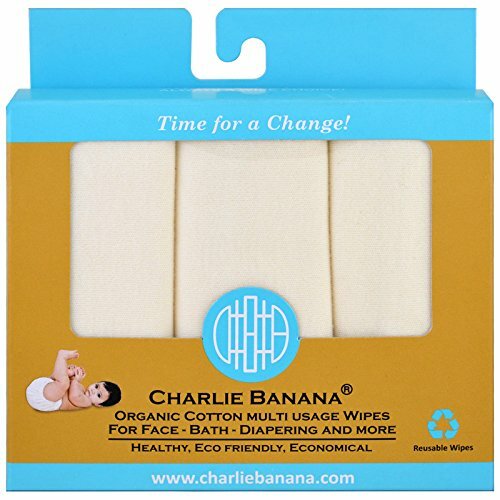 Charlie Banana Organic Cotton Wipes are ideal for every moment of the day, especially to clean your baby's bottom. These single-sided wipes consist of one layer of soft 100% organically-grown cotton yarn. They are strong enough to handle the dirtiest of diapers, but won't harm or irritate your baby. They are ideal for baby's gentle skin. Wet them with a little warm water and your baby will enjoy changing time every time. They are also perfect to cool off a feverish child, as a handkerchief, for wiping food spills, etc... A long-lasting item that we love. You'll never run out of wipes. WASTE REDUCTION IS EVERYONE'S PRIORITY. Place in washing pail until ready to wash. Machine wash cold or warm to a maximum of 4 degree celsius.